Are you missing out on opportunities because people don’t understand why what you do matters? Are you frustrated because you can’t get people to see the benefits of your ideas or offerings? Are you falling short of achieving the revenues you desire? If the answer to any of these questions is yes, you may not be communicating your value so that others get it. 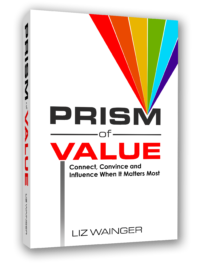 Too often people speak through a “Prism of Me,” suffering from “the list-maker syndrome.” Instead of talking about results achieved or problems solved, they offer lists of their products, services, and attributes and, in the end, sound like everyone else. In this lively, interactive workshop, you will learn how to move from “list-speak” to “value speak,” to build a strong personal or organizational brand that engages and connects with the people who matter most to your success. Contact us for rates and available dates. It’s 4 p.m. and a reporter calls and wants information on a confidential negotiation that has been leaked to the media. Or, your boss asks you to make a presentation to your Board or Executive Committee about the program you are launching. Perhaps a major donor has called to ask for a tour of your new neighborhood service center to understand what has been done with her gift. In each of these situations, you are called upon to present information and answer questions under pressure. Will you get your point across? Will you be heard and understood the way you intend? Will you motivate others to act? In this training session, you will learn how to make your case with confidence and avoid the common mistakes that lead to embarrassing blunders, bloopers, and faux pas. Learn how to hone your message, create memorable, clear and compelling talking points, anticipate hard and uncomfortable questions, and develop strategies to maintain control of the conversation firmly and gracefully. Level: Intermediate to Advanced: Managers, mid-level and above, who want to improve their ability to persuade and influence or are called upon to be spokespeople, including business and non-profit leadership in marketing, sales, development, finance and program/product development.